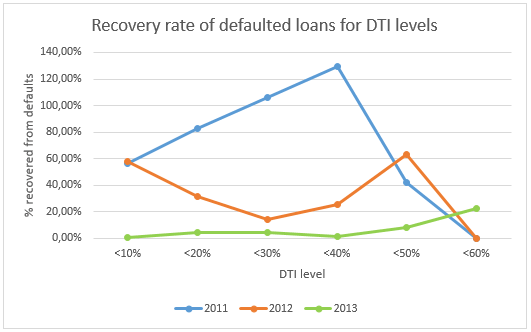 The chart below shows all recoveries and re-performing loans for different DTI levels and periods (years). As seen from the chart, the recovery rate for 2011 appears to increase as the DTI rises. Note that the recovery rate for DTI <60% is 0%, because there was no defaults on that level, even though the amount was the same as for <50% and <40% levels. As it is evident from the graph, the best recovery rate was for the <40% DTI. The recovery rate was, in fact, above 100%, meaning that the defaulted loans ended up repaying (principal + interests + penalties) more than the principal of defaults. For 2012, the lowest recovery rate appears to be at the 20-30% DTI level. With the exception of <10% and <30% DTI levels, the recovery rate is relatively equal for all debt-to-income levels. The recovery for <60% DTI is again at 0%, although this year there was 1 loan that defaulted. For 2013, we are currently observing a small increase in the recovery rate as the debt-to-income levels rise, although it is too early to draw any final conclusions for this year’s loans. Our data suggests that generally it takes more than a year from issuing the loan before the recovery rates start increasing, so we expect the rates for 2012-2013 to increase in the future. Higher debt-to-income doesn’t seem to have a negative effect on recovery based on our historical data. PS! Please note that the recovery rates only affect a small proportion of your loans (default loans). What affects the net returns of your investments most and should get most of your attention, is the net returns after the default rates. If this meets your investment goals, then any recovery is only a bonus that improves the results. * Please note that some of the data may be limited. For 2013, the data only includes loans that were mature enough in Feb 2014 to be able to default technically.